Many of you are curious to learn more about the “clean variation” of the TVC Stormtrooper (Mimban) figure that showed up on tunghori’s eBay store recently. We received our sample and added images of it to our gallery in the RDR including comparison shots. Simply put, this clean version of the Mimban Stormtrooper should give us a pretty good idea of what to expect from the upcoming TVC Rogue One Stormtrooper. It’s without any battle-damage markings at all and possesses a bone-white color which makes it unique to the other Imperial Stormtrooper action figures received to date, and we’re glad to have the figure in our collections now. The figure, to date, has not returned to this eBay seller’s store. Check out the update gallery HERE. You can still order this figure HERE at Walmart.com too. ← Gentle Giant LTD Announced Star Wars Celebration Exclusives! 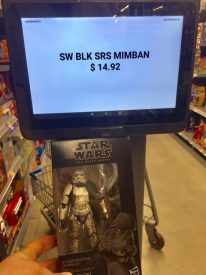 JTA reader Jay found the Walmart exclusive The Black Series 6″ Mimban Stormtrooper at his Mount Pleasant, SC Walmart for $15. If you are looking to army build this figure (or just trying to find it for the first time), keep checking your Walmarts. Let us know in the comments if you find it at your local Walmart below retail. Thanks for the store report, Jay! Walmart Exclusive TVC Stormtrooper (Mimban) BACK IN STOCK! If you’re quick, the Walmart exclusive TVC Stormtrooper (Mimban) figure is back in stock! Special thanks to JTA reader Justin V. for the alert! 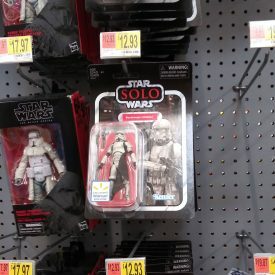 The TVC Stormtrooper (Mimban) has been showing up at retail across the U.S. in pretty high numbers lately, but if you haven’t been lucky enough to find it in the wild it’s back in stock at Walmart.com. Thanks to JTA reader Craig for the alert! 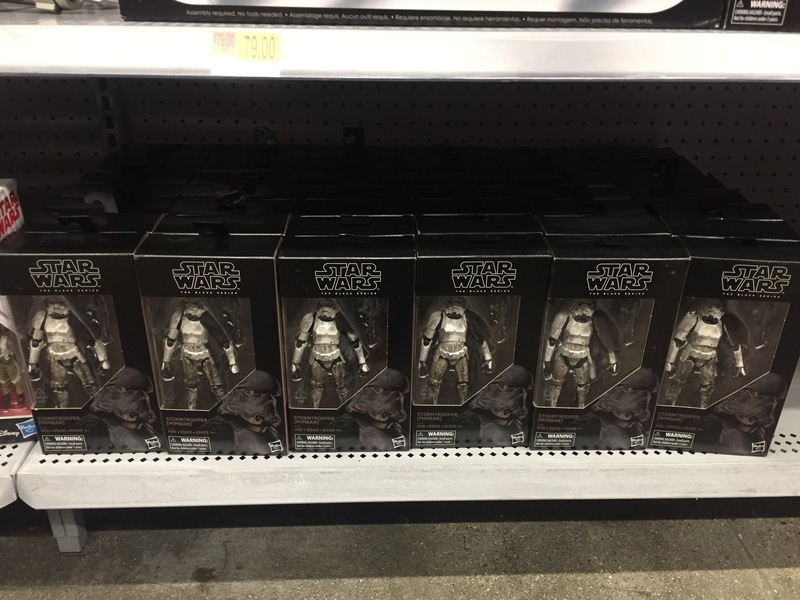 We’ve had tons of reports over the past few days of the previously MIA Stormtrooper (Mimban) The Vintage Collection figure showing up in large quantities at Walmarts. Viewers have reported from Illinois, Kentucky, Pennsylvania, Kansas, and New York, to name a few. If you have been waiting for this to drop on shelves, now is the time to start hunting. Thanks for all the viewers who wrote in, and chime in in the comments to post your own finds to help others out. ← Did You Ever Think We'd See Actual Playsets In The Vintage Collection? Shock! 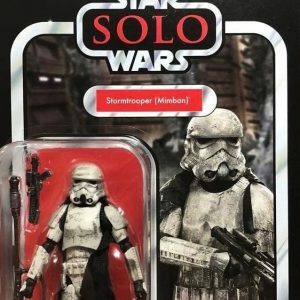 Walmart Exclusive TVC Mimban Stormtrooper Hits Store Level! Wow! It’s a miracle. The Walmart exclusive TVC Mimban Stormtrooper figure has finally hit brick and mortar. Special thanks to the Georgia Alliance of SW Collectors Facebook Group for the news! Imagine waiting for months for the Walmart exclusive The Vintage Collection Stormtrooper (Mimban) figure to arrive in stores. And then it never does. Imagine it finally arriving on Walmart’s online store but missing it because it sold out each time you got the alert it was in stock? Imagine finally placing an order which feels miraculous in and of itself, but also ships and arrives at your house without the order getting canceled. Then imagine opening the box and finding this. How much longer are we going to deny that everything is “situation normal” with the Hasbro Star Wars brand? Special thanks to friend Josh M. for this report and image. He didn’t care about the condition of these figures because he wanted openers, but if you’re a carded collector, this would be enough to kill the joy of the hobby for them. ← tunghori Restocks Loose Samples Of Yak Face, Klaatu Skiff, Leia Boushh Etc. Bubblegate Again! And With An Impossibly Difficult Figure To Secure! Goodness, gracious me! Bubblegate returns AGAIN! JTA Facebook reader Rob H. sends us a heartbreaking image of the Stormtrooper (Mimban) figure off of its card back while still in the bubble. I am not sure about you, but my figures arrived in terrible condition, and I have heard it’s been the consensus of many other collectors as well. Rob writes “Yes it was packed in a vinyl envelope but if this was torn off in shipping paper would have been removed from the card. It looks like it never had anything on it. I think this would come off with little effort.” Maybe your sample didn’t arrive after suffering abuse as his did, but this is a warning not to test fate and treat your own carded sample with extra tender loving care. How this figure wasn’t a general marketplace release is beyond my comprehension. Hey! The TVC Mimban Stormtrooper is BACK IN STOCK! BY the way, it looks like the MSRP is set to $19.99 for this item. I don’t think it’s changing! It’s another reason why Walmart should never be allowed to sell Star Wars figures again! It WAS The Vintage Collection Mimban Stormtrooper! NOW ARRIVING! 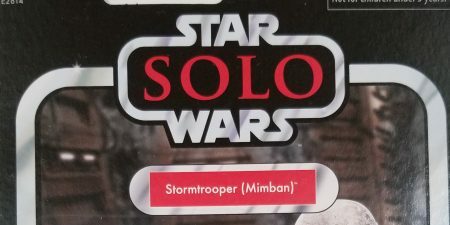 Walmart Exclusive TVC Mimban Stormtrooper IN STOCK! The price is high, but the 3.75″ TVC Mimban Stormtrooper is IN STOCK at Walmart.com as of this posting! Special thanks to JTA reader Scott M. for the alert! JTA reader Eric wrote in to let everyone know that his Burbank, California Walmart did a massive restock of the Stormtrooper (Mimban) 6-Inch figure. He counted at least 60 in-stock. Be on the look-out if you are still in the hunt for this figure at retail. Thanks for the update, Eric! Walmart Exclusive 6" Mimban Stormtrooper Hitting Again! 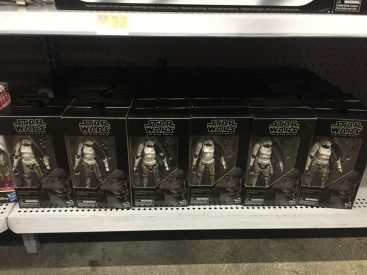 In what will go down as one of retail’s worst-handled exclusives of all time, more and more Walmarts are getting dumped with loads of the 6″ Stormtrooper (Mimban) figure. I have yet to see this figure in the wild, but we’re getting more reports that this is hitting once again just this week. Special thanks to JTA reader Ben H. for the image and story. ← HURRY! Get The TVC Imperial Combat Assault Tank On Amazon For Under $50! Found! Walmart Exclusive TVC Stormtrooper (Mimban) (VC123) Arrives! In Australia that is! Complete with Walmart stickers! Australia doesn’t even have Walmarts (yet)! How sad is it that the exclusive The Vintage Collection Stormtrooper (Mimban) figure for American Walmarts (that should have arrived months ago) is hitting in considerable numbers in Australia first? I mean, we’re happy for our fellow collectors in the land of “down under” but this is ridiculous. Special thanks to JTA reader General Solo for the image and report. We are happy to share an international store report from Switzerland. JTA reader Phil B. can confirm that some of Hasbro’s greatest exclusives are hitting his homeland, but not through standard retailers. These include The Black Series [Phase III] 6″ Gamorrean Guard and The Vintage Collection Stormtrooper (Mimban) figures! Awesome find! eBay seller tunghori has listed Han Solo and also lowered the price of the TVC Stormtrooper (Mimban) figure. Special thanks to all who wrote in to let us know! If you’re interested, we have reviewed all of these figures in our The Vintage Collection RDR database! ← TVC Chewbacca Figure Coming, Card Back Of Phasma Revealed! eBay seller tunghori has relisted some of the most highly sought-after TVC basic figures including Stormtrooper (Mimban), Rey (Island Journey) and Doctor Aphra! Hurry before they’re gone! Special thanks to JTA reader Mark and Gregory G. for the heads up! The Stormtrooper (Mimban) figure is listed on Walmart.com with an update that says available in stores only. We expect this to change shortly. ← A New The Black Series [Phase III] 6" Convention Exclusive Revealed! Are You Waiting For TVC Rey (Island Journey) And TVC Stormtrooper (Mimban)? Good Luck With That! 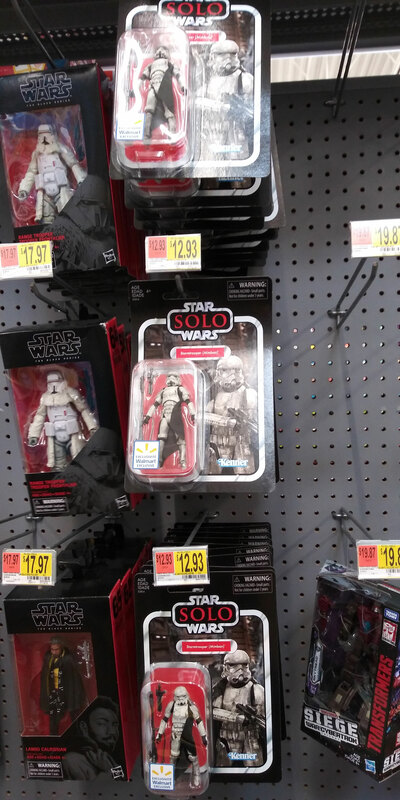 Well, take this as anecdotal evidence, or with a grain of salt as you wish, but Rey (Island Journey) is NEVER reaching Walmart stores until one major thing transpires…. like getting her UPC into their computers. This leaves even less hope for the TVC Stormtrooper (Mimban) figure too. A JTA reader who asked to remain anonymous performed an investigation and found out some disturbing news. I can reveal this. “I showed him the post from Steve at Hasbro saying the Rey figures shipped months ago. I then showed him screenshots I took of the figure on eBay. Most importantly, a picture of the UPC. He looked it up and said it was not even in their system. I asked him to elaborate, and he basically said without a number they recognize, it will never be moved to the stores.“ Is anyone else over this complete cluster of a mess? This is retailing basics, and Hasbro’s most significant retail partner is squandering the line right before our eyes. It’s maddening at this point. Hasbro, please read this. Is there anything you can do to help? Toys R Us Online Canada Has 6" Stormtrooper (Mimban) IN STOCK! In what might be its first available online presence besides eBay, The Black Series [Phase III] Stormtrooper (Mimban) 6″ figure is available to Canadian collectors via ToysRUs.ca! Thanks to JTA reader Eric C. for the news! If you decided to secure your TVC Stormtrooper (Mimban) from eBay when we posted this a while back they are starting to arrive. JTA reader Nathaniel wrote in to let us know he received his, and in perfect condition. If you want to pay a little more to secure this instead of relying on Walmart to actually make their stock available, there are plenty of auctions to choose from now… at a premium. Facebook page Star Wars Black Series 6″ figures is reporting that the USA Walmart exclusive Stormtrooper (Mimban) figure is arriving at Toys R Us in Canada. Maybe it will reach USA Walmarts before Christmas. And by Christmas, I mean Christmas 2019. Once again, I have been collecting modern Star Wars for 23 years, and I have never seen distribution worse than it is right now. Poor distribution is never proven by anecdotal evidence like this of course, but as we all know this is just the tip of the iceberg. I hope there is a positive turnaround coming. If you’re interested, we reviewed this awesome figure in May and you can check it out RIGHT HERE. 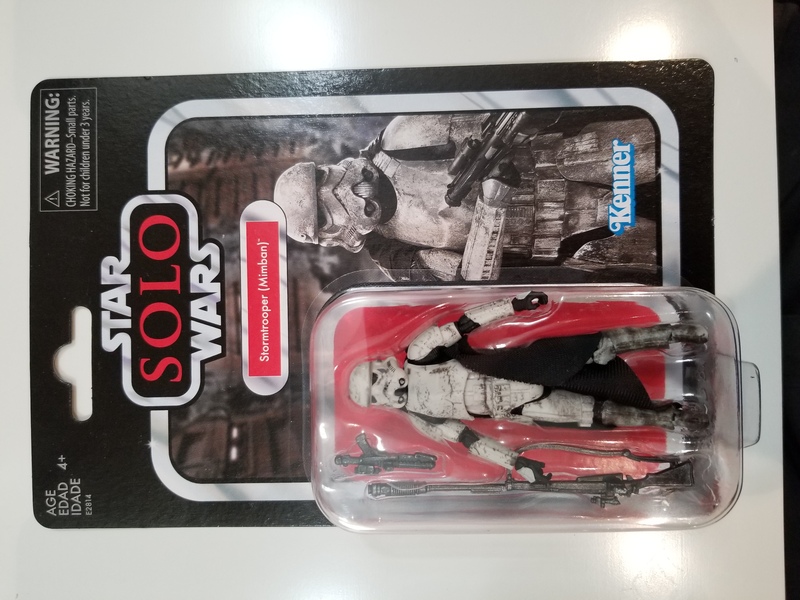 Check out our latest The Vintage Collection Visual Guide update, featuring the Walmart exclusive Stormtrooper (Mimban) (VC123). Click below to check out our fully detailed guide page, and click here to check out our extensive review. NEW FIGURES! Let’s check out the Stormtrooper (Mimban) figure from The Vintage Collection. It’s a Walmart exclusive that should be arriving this month, but don’t hold your breath! It’s a fantastic release. Hasbro should be proud of this one. Check out our full analysis in our Research Droids Reviews today! The full analysis is ready! Be sure to leave your thoughts in our comments section, vote in the poll or even comment about it on our Facebook page. Click the banner below for the direct link to the review! As always, you can also send your review requests via email if you’d like to see something that we didn’t cover yet. We have an exciting first look sneak peek at The Vintage Collection’s Stormtrooper (Mimban) (VC123) figure. We have one word for Hasbro: BRAVA! It’s beautiful. The Stormtrooper (Mimban) figure comes with an incredible 30 points of articulation. Hasbro tooled the armor in a way that optimizes the figure’s movement. Articulation enthusiasts are going to be thrilled once they realize the poses they’ll be able to achieve thanks to how Hasbro worked in this figure’s articulation. The paint operations are excellent, and he is relatively dirty but nowhere near as dirty as the troopers in the film. Once Hasbro announced this figure, collectors began clamoring for an all-new Stormtrooper sculpt utilizing most of this figure’s parts. Well, if Hasbro does use most of this figure, we have our definitive figure. The packaging is alright. The subtitle of “Mimban” in parentheses should be BENEATH the word “Stormtrooper” and not to the right of it. Come on, Hasbro. Your graphics department should have this locked down by now. The review is coming soon, but you can check most everything else right now. Enjoy! ← Literally And Legitimately.... #wheresrey? If you don’t want to play the waiting game for The Vintage Collection Stormtrooper (Mimban) figure like you are with Rey (Island Journey), the figure is in stock with limited quantities. Yes, the price is steep. Special thanks to JTA reader Rich K. for the alert!